Hector Noesi dominated the Texas Rangers on Tuesday night, holding their highly potent offense to just 3 hits over 8 innings of work, striking out 7 while walking only 2. Noesi still suffered the loss as Matt Harrison went 7 complete and held the Mariners to just 1 run on 7 hits. Noesi struggled in the 3rd inning after walking Nelson Cruz to lead off the inning and coming back to strike out Mike Napoli. Then Noesi walked Mitch Moreland and the Rangers were in business. Elvis Andrus came to the plate and hit a bases clearing triple to put the Rangers up 2 - 1. That would be enough to win it, but just for good measure, Josh Hamilton added an RBI ground rule double to score Andrus from third and the Rangers and the M's were done scoring for the night. A tough loss for the M's as they were looking for a season high 5th straight win, but even tougher on Noesi who pitched a one hitter outside of the 3rd inning. Both walks he gave up came in the third and two of the three hits were surrendered were as well. 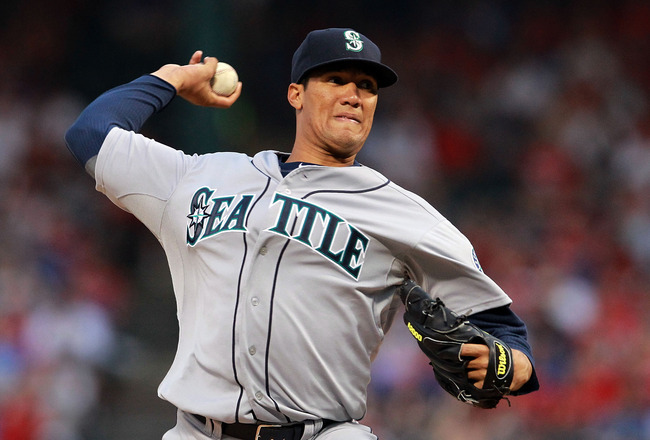 The Mariners couldn't capitalize with runners in scoring position once again. In the bottom of the 5th, Brendan Ryan hit a one out double and Dustin Ackley followed with a ground out to third base. A poor out that didn't even allow the runner to advance and it proved costly as Alex Liddi made it aboard on the next play and Ryan moved down to third. In the bottom of the 8th, Liddi and Ichiro Suzuki made it on base with singles and nobody was out. Ron Washington made the switch to the bullpen and Mike Adams came in to take care of business. Jesus Montero flew out, Justin Smoak struck out swinging and Kyle Seager followed suit with a strikeout to end the threat and bury the Mariners chances. Once again I am baffled by the constant idea that we need to go to the plate and search for that big hit when we have runners in scoring position. Eric Wedge keeps letting guys swing away and isn't making anyone lay down a sacrifice. We needed two runs to tie, I understand that, but if we would have pushed the runners over in that situation it would have added to the pressure, added to the momentum, and it would have taken the possibility of a double play out of the scenario. Of course, this is all a mute point when the next two hitters come up and whiff. This team is built for small ball and yet I rarely see it being played. Montero was the hitter and that could have been the reason not to make that decision, because he is our power hitter, but he is only hitting .255 with 6 homers. He is not Josh Hamilton. I'm still going to be on the fire Wedge bandwagon after this one. Four game winning streak or not, Wedge hasn't satisfied the Manager in me and isn't getting the job done. So far, all I've heard out of Wedge's mouth are a bunch of excuses about our guys being young. Well, tons of young hitters come into this league every year and knock the cover off the ball, somewhere there is a miss between the Mariners and their offense and I don't think it's the players that are the problem. The only other issue that is keeping our team from hitting? The dimensions of Safeco Field. We built our field to be a pitchers park and therefor nobody wants to play here. Griffey didn't, A-Rod didn't, Prince Fielder didn't, and after a couple of seasons of feeling inadequate, neither will half the guys on this roster. The Mariners front office have discussed the fence issue every year and have neglected to make any changes due to how our team was comprised, but after trading away half our pitching staff last year to acquire talent, this past off-season should have been the time to make that move. There is still time this coming off-season before Danny Hultzen, James Paxton or Taijuan Walker get their call up to the big leagues. In the grand scheme of things, with the steroid era over and homers coming a lot less, it's time to take a much longer look into the idea. If we don't do something about it, we're going to look back and see a team that is an extension of a farm system for other clubs and we'll have a bunch of guys on the team that are just waiting for free agency. Noesi should have won this game. Why didn't he?